What Day Of The Week Is May 19? 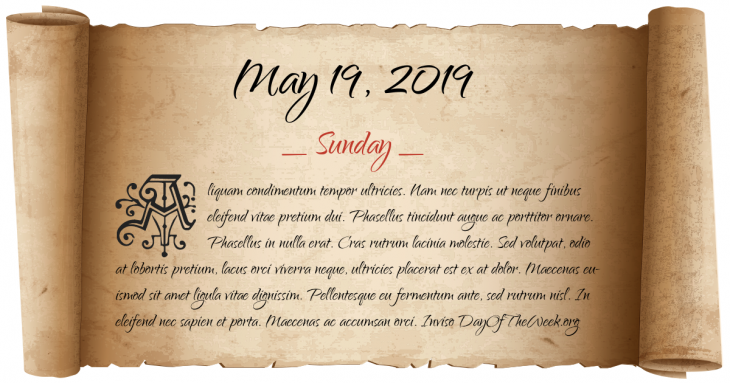 May 19, 2019 is the 139th day of the year 2019 in the Gregorian calendar. There are 226 days remaining until the end of the year. The day of the week is Sunday. New England’s Dark Day: A combination of thick smoke and heavy cloud cover causes complete darkness to fall on Eastern Canada and the New England area of the United States at 10:30 A.M.
Captain Sir John Franklin and his ill-fated Arctic expedition depart from Greenhithe, England. Mexican-American War: Mexico ratifies the Treaty of Guadalupe Hidalgo thus ending the war and ceding California, Nevada, Utah and parts of four other modern-day U.S. states to the United States for US$15 million. American Civil War: the Battle of Spotsylvania Court House ends. A birthday salute to U.S. President John F. Kennedy takes place at Madison Square Garden, New York City. The highlight is Marilyn Monroe’s rendition of “Happy Birthday”. The Royal Thai Armed Forces concludes its crackdown on protests by forcing the surrender of United Front for Democracy Against Dictatorship leaders. Who were born on May 19?